Big Bear Farms, Inc. is a family owned and operated farm. We follow the strict rules and regulations of the USDA - National Organic Program (NOP). We are now a dedicated U-PICK or WE-Pick operation only. Why buy imported fruit from unregulated countries that have been sprayed with all types of banned chemicals when you can have better at lower prices. We take pride in our ability to provide the individual local public comsumer with that personal touch in the growing that they deserve in supplying the needs of their families. We started in 1990 as a conventional farm but by 1991 we had stopped using any chemical pesticides in our production fields. The only thing that kept us from being organic was our use of regular chemical fertilizers. That changed in 2004. Today we meet all the NOP regulations by using NO synthetic herbicides, fungicides, miticides, insecticides or any other synthetic pesticides on our crops and only N.O.P. approved Organic fertilizers are used. We are proud to be the Only Organic Live Poultry operation in all of Hillsborough County. We have a variety of LIVE poultry such as Chicken Laying Hens, Roosters and Chicks. We will also have organic Eggs. Quantities are limited so please call ahead and place your order. These LIVE Poultry are great for pets or farming your own Organic Eggs! Pick up only. No deliveries. Must bring own container to transport home. We at BBFI are proud to provide for all orders to individual walk-in retail customers. Please refer to the links at the top of the page for additional information. 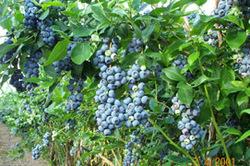 Click on CROP UPDATES at the top of this page to see this week if we will be u-picking blueberries, their price and harvest dates.You can also place our weekly updated website (bigbearfarms.mysite.com) on your favorites list OR you can now follow us on FACEBOOK. Click on TERMS & DIRECTIONS at the top of this page for Up-Pick information and directions to the farm. The State Of Florida "2004 Agriculture In The Classroom Teacher of the Year". The National Gardening Assoc. "2004 Garden of the Year". We at BBFI believe that the most important crop one can grow is a fertile mind.